A few months ago I got this cool new mug from Camelbak. I had been looking for a nice insulated travel mug to bring with me to school or work. This thing did just the trick. In this post I’ll go over the features of the mug and my experience with it. study guides 200-105 question 210-060 questions study guides 200-105 question Examinations play an important role 200-105 question in 210-060 questions achieving your academic and 200-105 question career 200-105 question study guides 210-060 questions 200-105 question aims. 210-060 questions study guides Find 210-060 questions the latest updates on exam results, schedules, 200-105 question application procedures 200-105 question and study guides more. Our 200-105 question articles study guides cover many study guides types 210-060 questions 200-105 question 200-105 question of exams for a 200-105 question broad 210-060 questions study guides range study guides of courses and 210-060 questions study guides specialties. 210-060 questions study guides 200-105 question We 200-105 question explore exams for fields study guides ranging from law study guides study guides to 200-105 question architecture to study guides fashion technology study guides 210-060 questions and design. We 200-105 question provide information on civil 210-060 questions service exams such as those 210-060 questions for the national 210-060 questions defence services or the police force.If you are focused on the healing arts, find 210-060 questions 210-060 questions out about admission 210-060 questions exams for studies in dentistry or medicine and surgery. Here is a quick video from Camelbak that goes over the Forge. I have been using this mug for a couple months now and I really like it. There are a few main features, which has made this my favorite mug, the one-handed self-sealing lever, easy to clean, the auto lock feature, and the vacuum insulation. The one-handed self-sealing lever is one of these mugs greatest features. It just allows the mug to be carried with such ease. I can just carry the mug in one finger or have it hanging by a carabineer or something attached to your back. You don’t have to worry about it leaking either; it has a really nice leak proof seal. The mug is super easy to clean. When you take the top off and press the button the arm flips up and you can easily access every thing you want to clean. You can also just throw the lid in the dishwasher. It’s recommended that you hand wash the main part. I don’t know about you, but I am a clumsy person always knocking my stuff all over the place so having an auto-locking lid is really nice to stop spills. If you want to vent your beverage it has a lock open feature too. The Vacuum insulation is really nice. 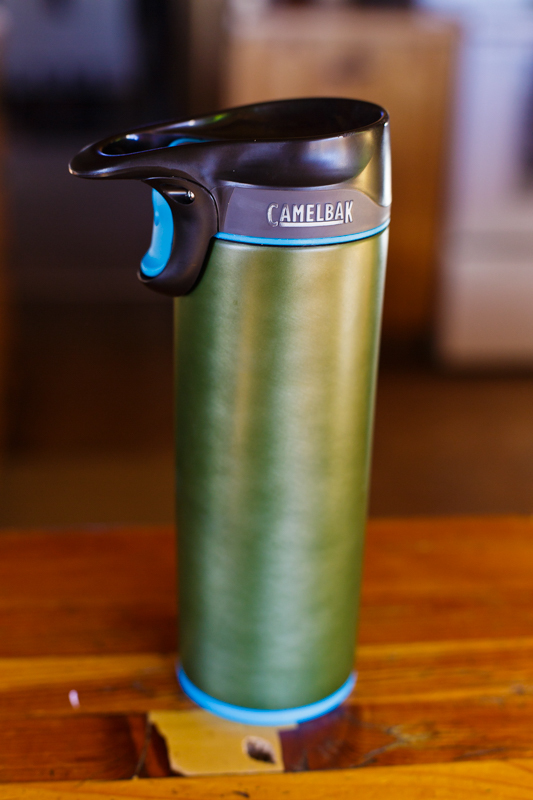 Camelbak says it will keep your beverages hot for up to four hours. I usually have my first mug of coffee or tea gone within an hour but with the travel time to school or work it has always been kept really hot and while drinking it has stayed hot. Overall I would really recommend this mug to anyone that is looking for a new travel mug, it’s a great color the green one, keeps your beverages really hot, and its just easy to take care off.